Conex boxes and other types of ground level storage are a valuable tool used in many industries. Whether you need last-minute material storage or a long-term solution to keep your equipment protected over the winter, a Conex box does the job. Ground level units make loading and unloading easy, no steps needed. Our storage units are all wind and water tight, lockable and secure. If you have any questions about your storage needs, stop by our location, contact us online or call today! TP Trailers ground level storage inventory includes both 20 foot containers and 40 foot containers for sale or rent. Find a cargo container that meets your needs for storage and space. TP Trailers & Truck Equipment offers 8 X 20 storage containers for sale or rent. 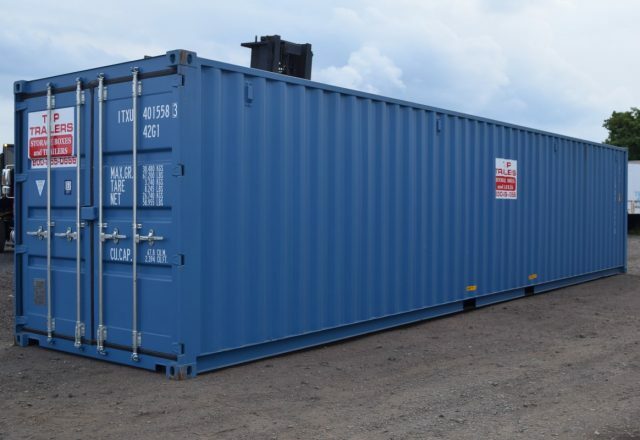 These 20 foot containers are a popular size as they provide sufficient storage for construction materials, retail merchandise or even some heavy-equipment. However, this size can also be space efficient in sites or parking lots when that is a factor. These units are delivered on a roll back, they require 60’ of straight space for loading and unloading and also require 13’ 6” of clearance to deliver. TP Trailers & Truck Equipment also offers 8 X 40 storage containers for sale or rent. 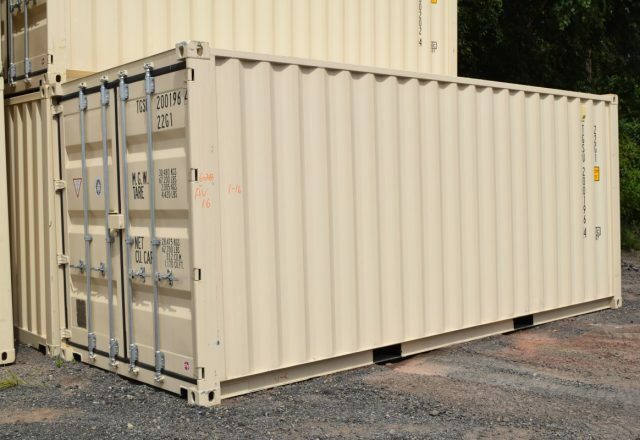 These 40 foot containers are our largest size, providing you sufficient space for your storage needs. The expanded dimensions make this 40 foot container a great buy when you need to store a large amount of materials or equipment. These units are delivered on a tractor trailer, they require 100’ of straight space for loading and unloading and also require 13’ 6” of clearance to deliver. Since TP Trailers offers both 20 foot and 40 foot containers for sale, you can match your ground level storage to the space you have available — and the needs you have. If you believe that your needs will exceed the allotted space of a 20 foot container then a 40 foot is your better option. Generally, it is more convenient to buy one 40 foot container than two 20 foot options. However, in some cases, having a 20 foot ground level storage unit is more convenient as the space to place a larger box is limited. Since all containers require a level surface, this can occasionally limit where they can be delivered. Some general contractors only allow each sub-contractor to have a certain amount of storage space on the construction site. If you only have an 8X40 container this can prove problematic. If you have any questions about the right size Conex box you need, contact us for a conversation — and to get a quote. One of the reasons that TP Trailers & Truck Equipment has developed such a stellar relationship is that we make our clients a priority and we stand behind our products. We ensure that all of our Conex boxes are wind and watertight and completely free of damage. If your 20 foot container or 40 foot container is damaged or not up to our standards, we will replace it and make it right. Some online cargo container retailers make their money by offering bottom-of-the-barrel pricing on sub-standard units — that’s not our style. We succeed by offering competitive pricing on high-quality units and building relationships with our customers that last. Contact us to learn about our pricing on 20 foot and 40 foot containers — and to have all of your questions answered.